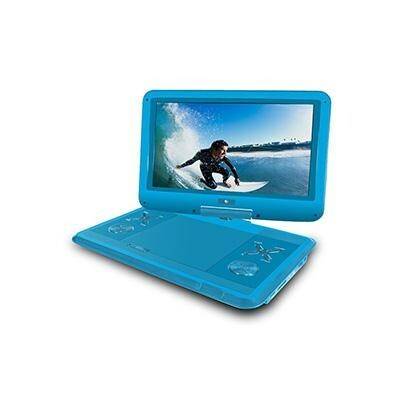 EPD121 12.1 Portable DVD Player with Travel Bag & Headphones. The Ematic 12.1" Portable DVD Player makes it easy to enjoy your favorite movies, videos, music and pictures anytime, anywhere. The high-resolution screen tilts and swivels to provide an optimum-viewing angle in all situations. The built-in rechargeable battery makes this versatile media player ideal for the user on the go. 12.1" 1366 x 768 LCD screen 180 screen tilt and swivel, Built-in stereo speakers, Compatible with DVD, VCD, CD, MP3, MPEG4, PAL/NTSC/AUTO/SECAM, Frequency Response: 20Hz to 20KHz, Video Output: 2 Vp-p/75 Ohm, unbalanced, Audio Output: 2Vrms/8kOhm, Audio S/N: Better than 50dB, Laser: Semiconductor Laser, Wave Length: 650nm / 795nm, Power Source: DC 12V, Power Consumption: 15 W, Operating Temperature: -4 - 122 F, Weight: 2.43 lbs, Dimensions: 12.21 x 8.27 x 1.78, Battery Type: Lithium Polymer, In the Box: DVD Player, Remote Control, AC/DC Power Adapter, User Manual. Blue.